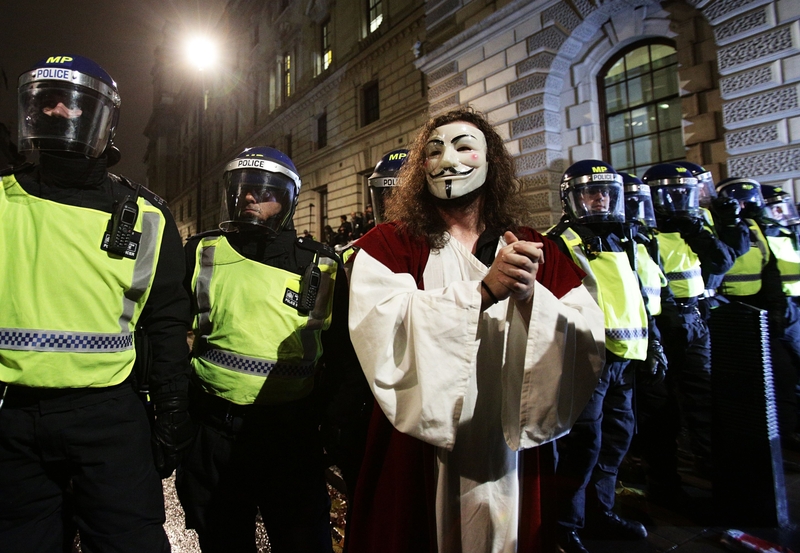 A protester stands in front of police officers during the Million Mask March bonfire night protest in central London, organised by activist group Anonymous. 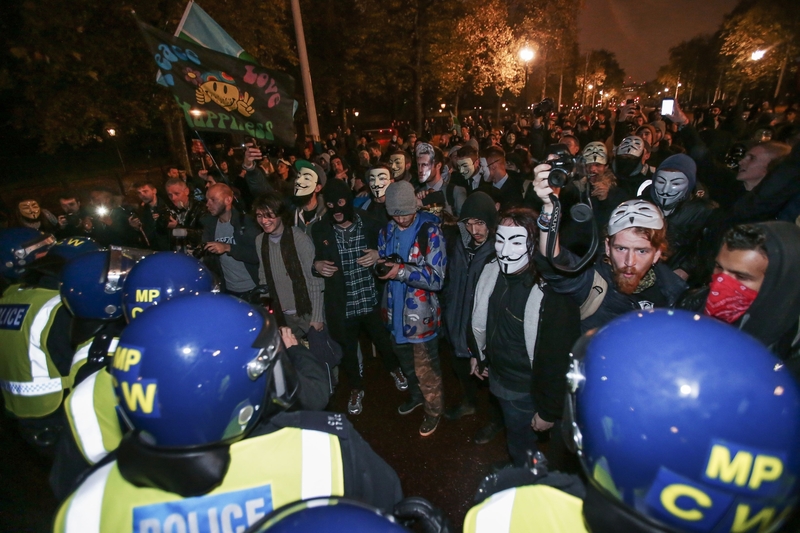 An anti capitalism march in London organised for November 5 resulted in at least 50 arrests last night. 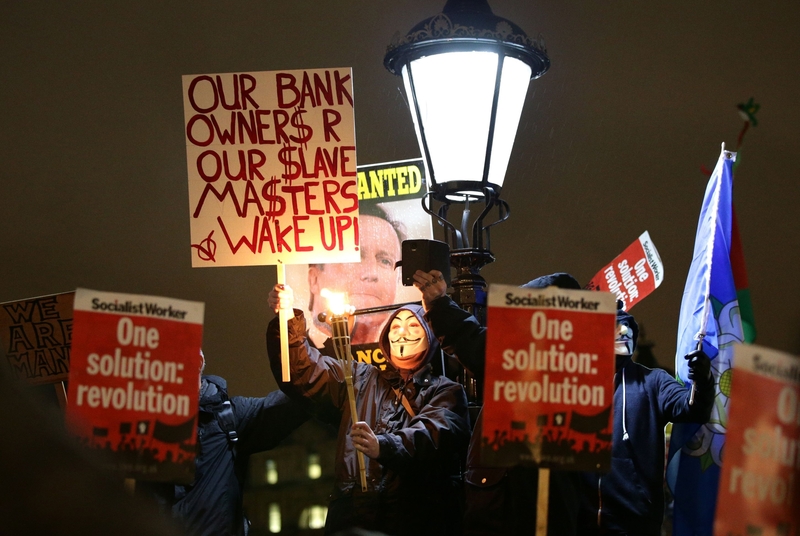 The Million Mask March, organised by Anonymous to hit back at austerity measures and perceived inequality brought about by the Government, started peacefully enough, with songs and chants at Trafalgar Square. 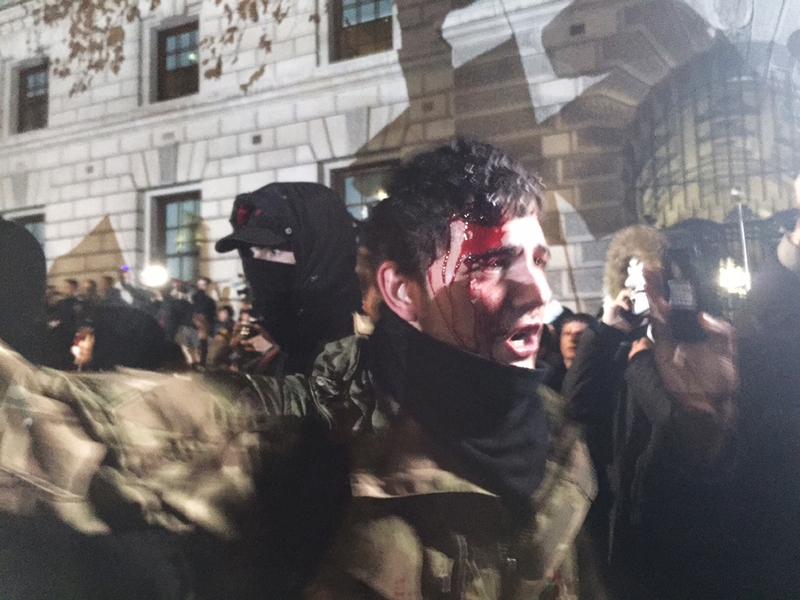 But the demonstration soon turned ugly, with bloodied bodies being tended to by emergency crews as police and mounted officers formed human shields on sections of Westminster closed off to surging protesters. One animal bolted as an explosive whizzed past its head. Many protesters carried placards bearing the message “One solution: Revolution”, although other pockets screamed “Whose streets? Our streets” as confused tourists looked on and took pictures. One activist, who gave her name as Lola, said she had travelled from Hull to the capital to speak up for others. 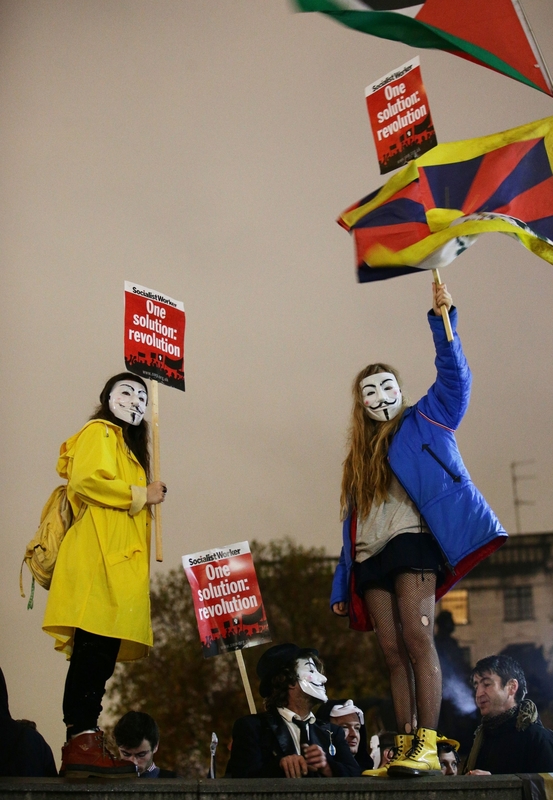 The London protest is one of many similar marches held worldwide on November 5. Its agenda is broadly anti-capitalism and pro-civil liberty. The march started peacefully enough, with the parade stopping outside the entrance to Downing Street where many, predictably, booed. 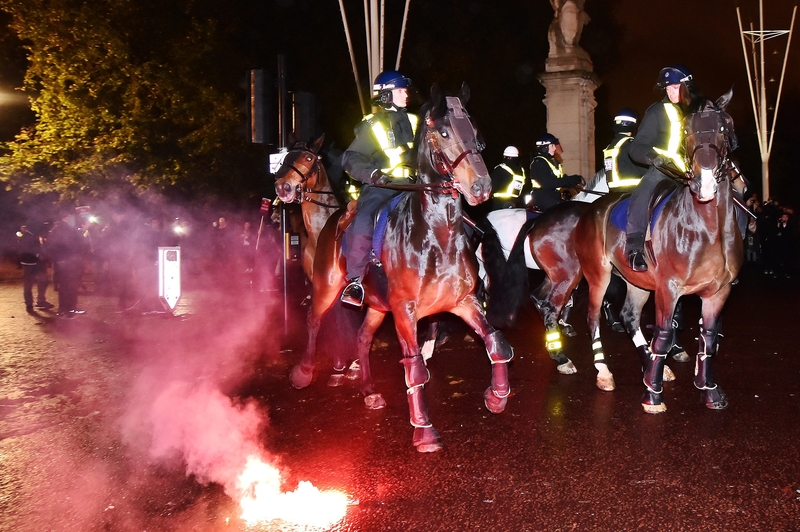 But large groups of protesters appeared to break off from the main collective as the parade made its way to Parliament Square, forcing officers into action. 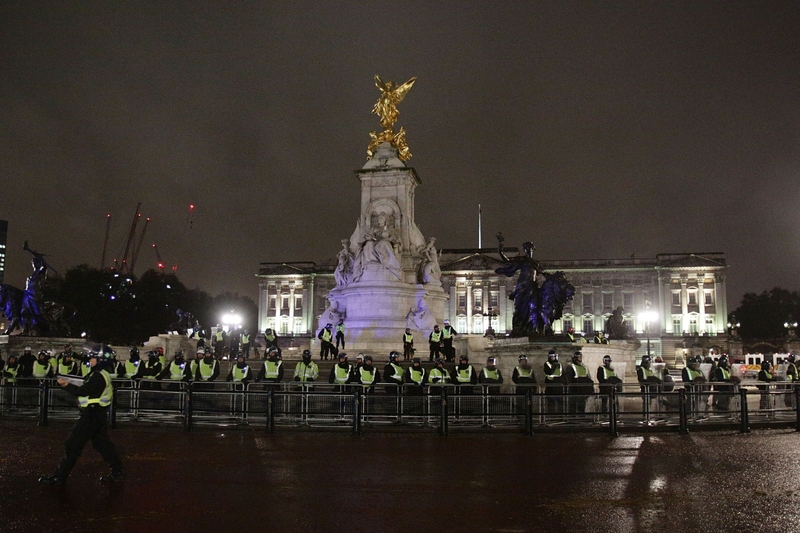 Those who remained were treated to an impromptu fireworks show – not part of the organised display across the Thames – as several attendees scrolled through their phones for news of where to head for. One protester, a DJ from Camden called James Cee, said he was disappointed with the turnout. 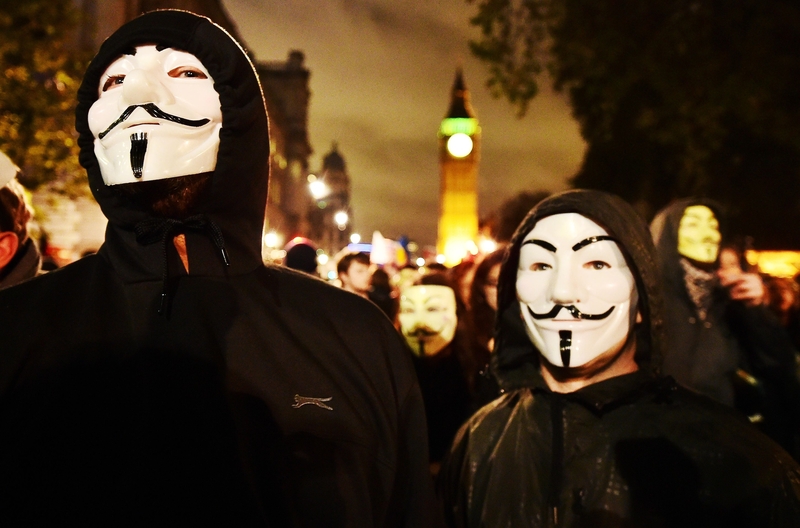 The London protest is one of many similar marches held worldwide on November 5. He said: “Being here in a big crowd is doing nothing wrong. “Personally, I don’t like violence. There isn’t a need for it here and I think some people are put off by it. Another protester, a 55-year-old from north London who went by the name Shero, said: “As an English Muslim, I feel I am not represented. Earlier in the parade, 24-year-old Dylan Connolly, from Stoke on Trent, acted as a pallbearer, carrying a coffin inscribed with the words “fear and anxiety”. He said the prop was an emblem of his decision to ignore media messages blaming society’s problems on minorities. Protesters ended up splitting into different factions, with some ending up in Mayfair’s Conduit Street, where windows were smashed. Staff and customers also became trapped inside a designer shop off Regent Street as the protest raged outside. In one surreal moment, protesters ended up outside the UK premiere of the latest instalment of The Hunger Games, where Hollywood stars Jennifer Lawrence and Julianne Moore walked the red carpet in Leicester Square. 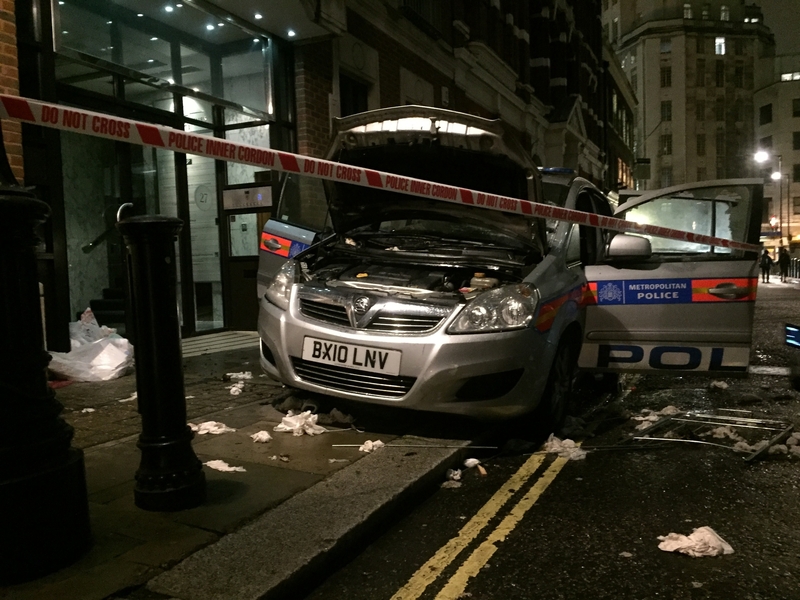 A police patrol car was set alight on Queen Anne’s Gateway, a short distance from the inaccessible Conservative Party HQ, while rubbish bins were pushed over as London’s tourists looked on in bewilderment. 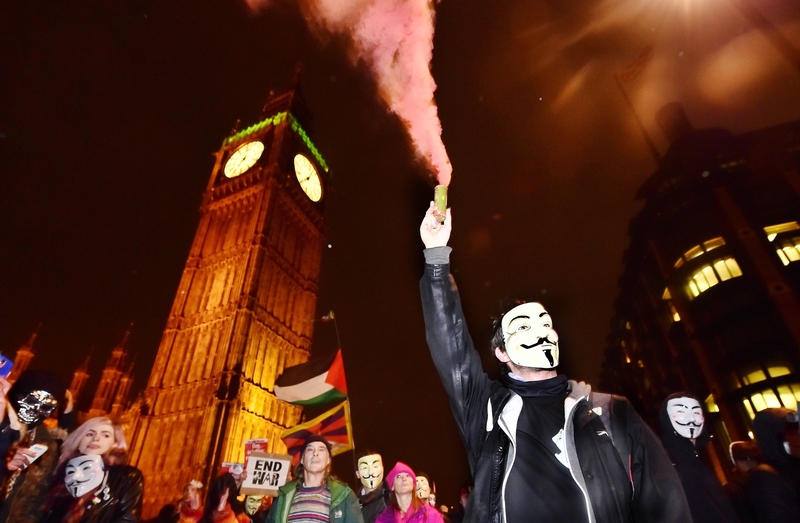 The final few protesters returned to Nelson’s Column shortly after 9.30pm, with some launching fireworks across Trafalgar Square. 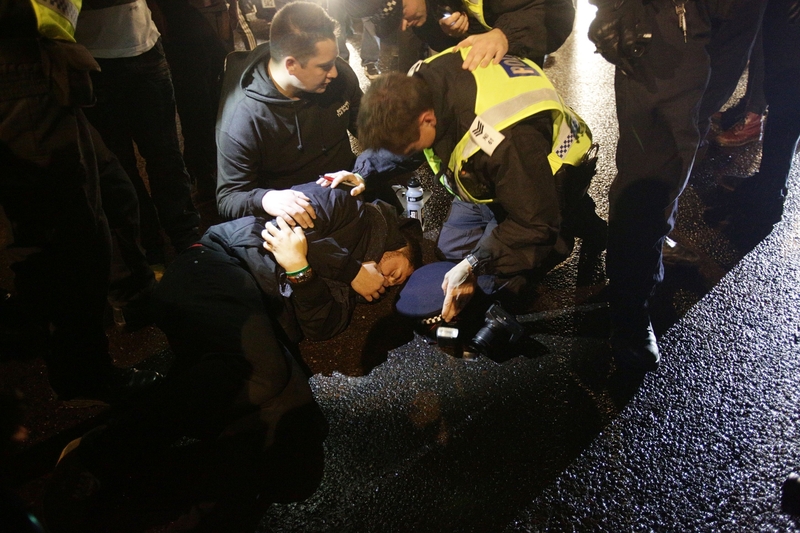 Police began threatening people with arrest soon after as the march was officially due to end at 9pm. It went on for at least an hour and a half longer. 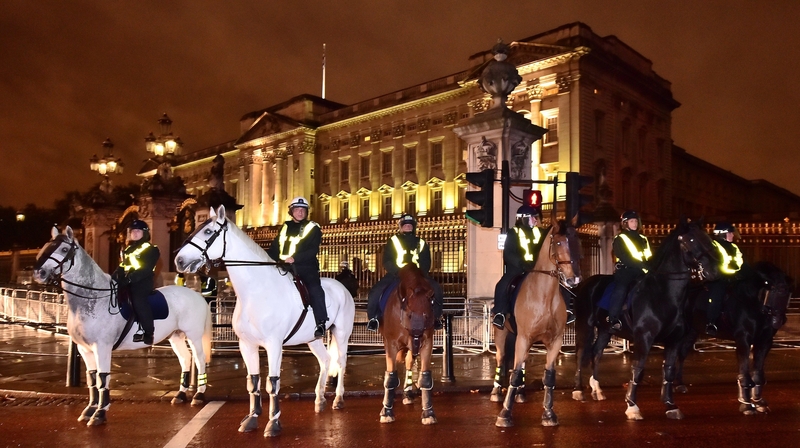 The Metropolitan Police said at least 50 arrests were made, mainly for public order offences with two for assaulting a police officer.